Anxiety is a common symptom of menopause, and it can harm your quality of life. When you're constantly worried, on edge, or impatient, it can take over your mind to the point where you can't enjoy your days. Reading your favorite book, talking with your best friends, or relaxing on the beach becomes secondary to obsessive concerns. In order to counter it, it's important that you learn more about your condition. When you know why these unpleasant attacks occur, you will be better able to address the problem. 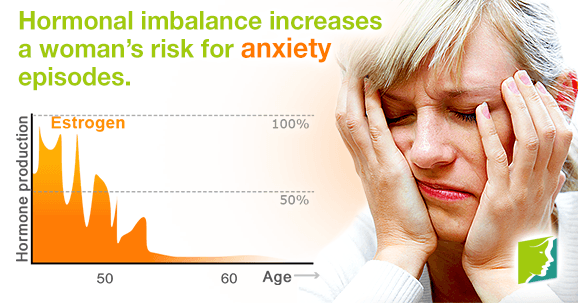 During menopause, a woman's risk for anxiety episodes is significantly higher than ever. This is due to the sharp decline in your body's natural estrogen production. A lack of estrogen causes an imbalance in neurotransmitters in the brain - such as serotonin and endorphins - that are essential for keeping a relaxed, happy mindset. At the same time, there is a rise in levels of cortisol, a stress hormone that can keep you on edge. Nutrient deficiencies can be more of a detriment to mental health than individuals realize. When you are low on certain key vitamins and minerals, it can make you irritable and restless. B vitamin levels, for example - especially B12, B9, and B6 - tend to be lower in those with generalized anxiety disorder. B6 in particular plays a part in the regulation of serotonin in the brain. Vitamin D may also help in boosting mood and decreasing sadness and depression. Finally, omega-3 and 6 are essential for clear-thinking and other cognitive functions. Other calming nutrients to keep an eye out for are the antioxidant vitamins - A, C, and E.
When you lead a sedentary lifestyle, tension may start to build up. Exercise not only reduces cortisol, but it also increases the release of serotonin. Try exercising 30 minutes a day, five times a week, to see positive results. In addition, excessive alcohol intake is known to raise stress levels. Although it can relieve anxiety initially, it is often short-lived. At the same time, if you do not get a good night's sleep, it won't give your mind a chance to rest. The resulting fatigue will make it harder for you to think clearly and fulfill daily tasks. There can also be the many personal causes for anxiety episodes. They may be related to your relationships, your children, your job, or the death of a loved one. There are many moments in life that can trigger anxiety episodes. In these situations, try to keep your chin up and understand that everything will be okay. In such cases, talking with a counselor or joining a menopausal support group can be a source of comfort from people who understand what you're going through. When you regulate your hormone levels, balance your diet, and practice deep relaxation techniques, your chances of experiencing anxiety will go down, and your ability to cope with oncoming episodes will improve. Don't fall prey to negative thought patterns or wrestle with reality. There is help available.